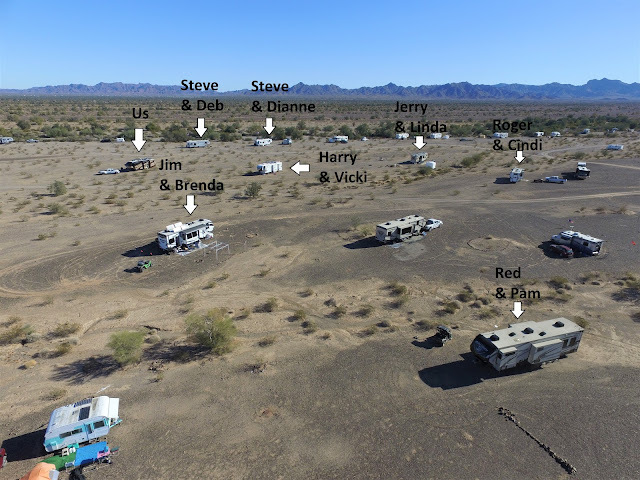 La Posa South LTVA (Long Term Visitor Area) in Quartzsite is going to be our home for the next month and we were anxious to find a spot to call our own. We were a month later in arriving than we were last year and with “The Show” starting in just two days the place pretty full already. Luckily, we had a couple of secret agents keeping an eye out for open sites and a site was opening up where a lot of our friends were the day we happened to be arriving. So with tables and chairs at the ready Vicki and Harry as well as Deb and Steve watched the occupants packing up and as soon as they pulled out they sprinted over and placed their furniture in the vacated spot in the hopes that it would still be available when we got there. As luck would have it we pulled in within 15 minutes of the old tenants leaving and we were able to slide right in! And what a great spot it is, as we are within 100 yards of not only Vicki, Harry, Deb and Steve, we were also within 100 yards of Steve and Dianne, Jim and Brenda (our South Dakota neighbors), Jerry and Linda, Red and Pam as well as Cindi and Roger! Once we got settled we wandered over to Steve and Dianne’s for happy hour (we did not waste any time!) 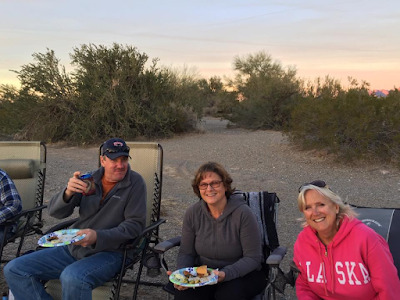 It is good to see our Quartzsite friends again! Les and Sue even made a guest appearance on their way by! The next night Dianne made a huge pot of chili and we had another late night around the fire. As we sat around the fire talking smart we made plans to attend the RC plane swap meet at the airfield the next day after Red had breakfast. The next thing Pam knew most of us had invited ourselves over to their place the next morning for biscuits and gravy before heading out. There were a lot of cool planes at the swap meet but none of us ended up buying anything. This guy had quite the set up! Even though the government may have shut down, the socializing did not. One evening we traveled over to Plomosa Road to visit friends Dave and Maxine along with Tracey and DeLano. We had met both of them a couple of years ago while doing the road mapping job. Although we have seen Dave and Maxine a couple times since then, we have not seen Tracey and Delano in a couple years. It was great catching up with them and meeting Tracey and DeLano's bird Petri. The next night Pam hosted a "Hobo Soup Night" with many of our LaPosa South friends. Everyone brought a soup ingredient and dumped it into a large pot. Some brought meat, some brought corn, others brought onions, tomatoes, celery.... a literal potpourri of ingredients. Although everyone raved about how good it was, I am not that adventurous and stuck to my cheese and crackers. 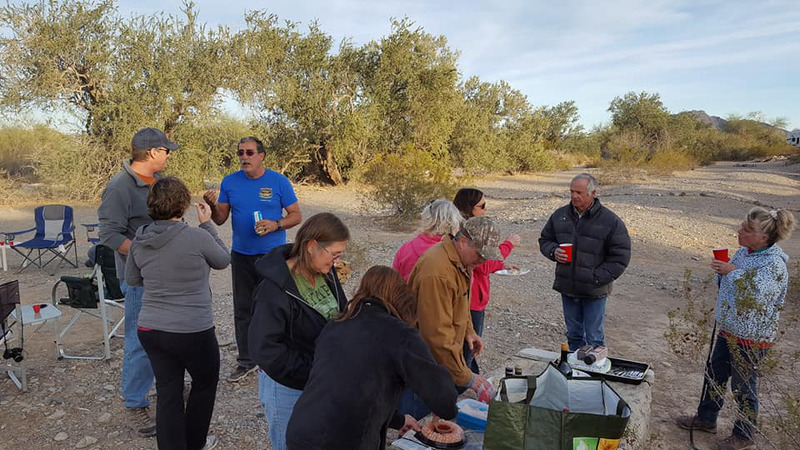 It was our largest gathering so far this season with about almost 30 people in attendance. Al and Donna Ferguson stopped by for a bit and Faye and Dave have now joined our little community for a few days. We have been following each others blogs for years and this is only our second time getting together since meeting them in Alaska in 2015. Once the sun went down Barb and I snuck away to walk the dogs and get some beauty rest as the next day we were up bright and early for a day trip to Mexico with Harry! Wait, weren't we just in Mexico last week? Why, yes we were but Harry needed to make a quick trip down to see the dentist so we asked if they had room for two more. This trip Barb wanted to see about getting new lens for her sunglasses. She had been quoted over $400 for just the new lens from her optometrist here in the states. She went to Best Optical in Los Algodones where they did an eye exam and she got new lens for $79. We are curious how well these hold up compared to her old lens but the over $300 savings is substantial. While we were there we ate at a small restaurant with great shrimp tacos. We would highly recommend it if you are down there. When we got home, Rick and Kathy Rousseau stopped by for a visit. Apparently they had tried to find our rig the day before and ended up in the nudie section. I am not sure if Rick was really looking for our rig or just an excuse to explore that area. As if we did not have enough activity for the week, Thursday night we saw Steve and Dianne outside their rig so we walked over to say hi. Soon Harry and Vicki walked over then Steve and Deb. 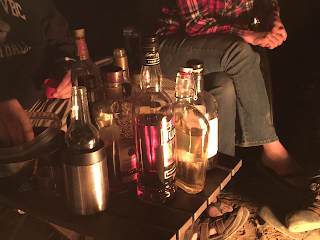 Somehow we got to talking about different types of booze and next thing we knew there were about a dozen booze bottles gathered around the group and we had in impromptu booze tasting. Big mistake! I would tell you that the night ended with me guiding Barb back to the rig where she spent the night on the floor with half her body in the bathroom and half in the hallway but she probably would get mad at me so I won't tell you that. About 2:00am I woke up and was very hungry and realized that we had not had dinner. Do I risk getting out of bed and stepping over her in the hallway? Would she bite my ankle as I went by? I instead decide to tough it out a few more hours until breakfast. At 2:30 she woke up and climbed into bed. Would now be a good time to ask what's for dinner? As I played several scenarios of asking this question through my mind none of them ended with me getting something to eat so I opted to say nothing. As soon as she was asleep I crept out of bed and got some crackers, huddled in a corner and quietly ate them while keeping one eye on the bedroom door. She was very, very slow the next morning and actually throughout the day. I did what I could to make her feel comfortable but for the most part I just kept my distance as I learned long ago not to poke a cranky bear. She should have stopped at one! Friday night Steve and Dianne had a get together to welcome their Canadian friends Dave and Leslie. They are from Alberta and have been following our blog for quite a while. Many of the usual suspects were in attendance, all told there were over 20 people there including Jim and Cec from British Columbia who also parked in the area and have been following our blog. It was great getting to know all of them a little better. Barb was still not feeling well so we called it a night quite early and got her to bed. Week One is in the books here in Q. I don't know how it could have been much busier but I think we are about to find out as today Barb is headed to Phoenix to pick up our daughter Jessica and our grandchildren Dylan (8) and Kendall aka Baby K, aka Special K (3) who is coming to visit for a week in the desert. Before I get to our time in Los Algodones, I need to mention our time in Casa Grande. We had driven through the Casa Grande area several times over the past few years but have never stopped to take in the area. This year we decided to spend a couple of days while waiting for my dental appointment on the 16th. 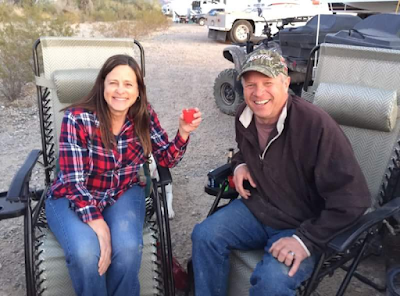 We had two sets of friends staying at Palm Creek Golf & RV Park so we looked into their “first-timers special” in hopes of staying there during our visit. But at almost $60 a night it was over what we were willing to spend. Instead we opted for High Chaparral a few miles outside of town. At $15/night (Passport America) this fit our needs perfectly. Our friends Steve and Dianne had recently stayed here and highly recommended it. The park itself has almost 200 sites that are closely packed but still far enough apart that you don’t feel too crowded. They have a pool, hot tub and a couple of pickleball courts. The park allows you to wash your rig at your site so that it is what I did for a few hours the first two mornings before it got too hot. Daytime temperatures were in the mid 70’s, something we have not experienced in quite a while! The first afternoon we were there we met up with Nancy and Greg both former co-workers of Barb’s back in Minnesota. We met them at we are now calling “Our New Favorite Bar”. After reading Steve and Dianne’s blog post of their stay in the area we just knew that we had to visit The Thirsty Donkey. It is unlike any bar we have visited in that it is a self-serve bar with 40 taps lining the walls. How does it work? Well, you give them your driver’s license, they scan it and return it to you with a wrist band with a proximity sensor on it. You are then free to get beer from any one of the taps along the wall. When you find a beer you want to try you hold your wrist band to the tap, it turns green and you pour your beer. As you get more beer, it tells you the total ounces that you have poured so far. When you are done, you give your wrist band back to the server who scans it and give you an itemized listing of each of the beers/ounces you had. Very cool! The beers probably range anywhere from .20-40 an ounce. It is a great way to sample a bunch of different beers at your own pace without having to wait for someone to wait on you. We had a great time visiting and catching up and made plans to see them on Sunday as well. The next day we traveled over to Palm Creek to visit with Dave and Diane who we had met in Quartzsite a couple years ago. We were totally unprepared for what we encountered when we got there. We knew their site number and just thought we would drive around until we saw their rig. When we got there we knew we were in trouble. There are over 2,000 sites covering a multitude number of blocks! We were driving pretty much aimlessly when this guy pulls up to us on his bike and asks us if we are lost….. it is Dave! As we follow him back to his rig it is obvious that we would have never found them! As we see Dave turn into his site on his bike we look out the window and who do we see standing outside her rig? Nancy! Out of 2,000 sites, they are basically neighbors. Barb gets out and I pull into Dave’s site. Dave and Diane are very active with biking, golfing and pickleball so they are really getting the most out of the amenities of the park and have planned a 4 month stay this year. We visited for about 3 hours before making our way back home. Palm Creek is a great park for those who take advantage of everything they have to offer and is more affordable with their monthly (~$900-$1,000) or multi-month (~$800) rates……Someday maybe but right now we just would not get our monies worth out of it. Casa Grande is a great little town and we could definitely see ourselves spending more time there. Sunday we traveled back over to Palm Creek to watch the Vikings game with Greg and Nancy. The first half of the game was great and the Vikings dominated Saints. The 2nd half a totally different Vikings team came out of the field and it looked like they were going to implode in typical Vikings fashion. For those of you who are lifelong Vikings fans you know what I mean. What happened at the end of that game is still a shock, I just sat there staring at the television unable to process what actually happened! Nancy, all ready for the Viking's game! The next morning we packed up and drove the three hours to Yuma. Our only reason for coming here was to go to the dentist and pick up a few prescriptions. We pulled into the Quechan Casino which has a section of their parking lot where they allow RV’er and truckers to stay during their visit. No hookups, no organization, just a large dirt parking lot where you can park. Some are there for just one night while others look like they have been there a little while. Although a little noisier than an RV park, it is a great spot to spend a few days for free. We planned on staying for….. well, we really didn’t know. We had set aside up to 5 days but it all depended on exactly what I needed done for dental work. The next morning we jumped in the truck and drove 2-3 miles down the road to the border parking area. For $6/day you can park in a secured area for the day. There is free parking along the road a mile or so before the parking area as well for those who want to walk a little bit. There are so many dental options in Los Algodones it is mind-boggling when trying to decide which ones are reputable and reliable. We (by "we" I mean Barb) did a lot of research online. Blogs, articles, reviews.... and we decided on Sani Dental. We have friends who have used Bernal Dental several times and are very happy. Since we were happy with Sani the first time, we went back there again. We had made an appointment with our anticipated arrival date more than a month ago and changed the appointment twice as our arrival date changed. On the appointed day we arrived at Sani Dental 40 minutes prior to my 9:30 appointment. As it turns out they could not find me but got me in right away. In fact, I got in before the guy who was there for his 9:00 appointment. So far so good! The first step was a consultation where they explained everything that was going to happen today. Next up was x-rays ($60). I was escorted into a room with a stand up x-ray machine where I was asked to stand in a certain position and bite down on a mouthpiece and hold still. The machine then spun around my head while I stood still and within a minute I was done. Next up I was taken to a room where they went over the results and gave me recommendations. In my case the recommendations was 2 crowns and a filling for which they quoted me a little over $1,000. When I told them I wanted metal/porcelain instead of full porcelain crowns and to take off the cleaning (I get those for free with our preventative insurance) the total went down to $465 for everything. Once that was worked out I was taken back up front where I was asked to put down a deposit. They take cash, check or a credit card (4% fee). While I was paying for my dental work I overheard another customer ask if they covered hotel fees which apparently they do and she got $360 off her bill. I am not sure if they do this for all hotels or just certain ones. A short time later they called me in for the work. The dentist herself spoke very little English but the assistant spoke it fluently. An hour and a half of drilling, impressions and whatever else they do I was out of there with two temporary crowns and told to come back the next day at 11:00. From there we went to El' Paraiso where we had tacos and beer. The beer was good, the tacos were just okay. Then it was onto the pharmacy and liquor store. At the pharmacy we got Z-packs ($3.99), 800mg Ibuprofen ($3.99), 100 ct Amoxicillin ($5.99) and Mucinex ($8.00). At the liquor store we each got a bottle of Tequila as that is about the only thing it is worth buying down here. We were back at the rig exactly 4 hours from when we left it. My next appointment was the following day at 11:00. We arrived at 10:15 hoping to get in early. I sat in the waiting room while Barb went and wandered the streets of Mexico. That is one nice thing about Los Algodones, you feel safe walking the streets. The vendors are assertive trying to get you to look at their goods but not overly aggressive. You get used to it and mostly just ignore them. We did not feel nearly as comfortable when we visited Nogales last year. Barb was back with her treasures before I was called in for my appointment. She had bought two blankets and one table cloth. She got the blankets for $7 each (she had talked them down from $15). The table cloth started out at $25 and she got it for $18). At 11:00 they called me in for my appointment. I was greeted by the same dentist and assistant as the day before. I was not sure what they were going to do and did not know what to expect. The first thing the dentist did was pop out both my temporary crowns and then I think she tested the new crowns for fit. She then put the temps back in said to come back the next day at 9:00 for the final crown fitting and the filling. We were back in the truck and headed back to the rig by noon. The final day we arrived 15 minutes early for my appointment. When I was called in they fitted the crowns, did some grinding to touch them up and send them out to be polished. While we waited for that they worked on my filling then cemented the permanent crowns in place. They followed that up with more x-rays for their warranty record. The crowns and filling have a 2 year warranty if anything happens to them. We were out of there and headed back to the truck in about and on the road headed to Quartzsite by noon. Overall I was very satisfied with the work done here and saved over $2,000. Time will tell how it stands up compared to a dentist in the U.S. but I have not had any issues with the work I had done a few years ago so we are hoping for the same. We hurried back to the casino where we packed up and drove the 82 miles to Quartzsite where a whole new adventure awaits us! A coyote pauses at the edge of the road and waits for me to pass before he saunters across and into the drainage on the other side. It is good to be back in Arizona. 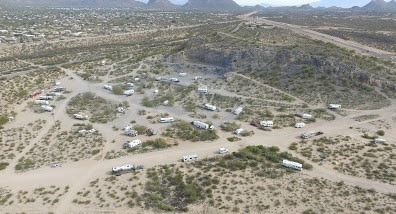 Our eventual destination is Quartzsite or “Q” by those who have been there a time or two. But right now we are on the southern edge of Tucson. This is the third time we have stayed at the Snyder Hills BLM Area (32.156941, -111.116493) in the almost 4 years we have been on the road. We originally found this site on Free Campsites.Net where it get mostly favorable reviews. I don’t know how to accurately describe Snyder Hills. There are good parts and bad parts, I guess that is true with almost everywhere we go but the degree of good parts and bad parts tends to vary. The good parts is that it is free, it is warm and it is centrally located to almost anything you need to get to in the Tucson area. The bad part is that not everyone takes care of the area like they could. There are a variety of rigs, campers and tents in the area and although it has a 14 day limit, I don’t think that is enforced very strictly. There is one porta potty but it is obvious that not all bother walking that far to use it. Some would probably never stay here for those reasons or fearing that someone might steal something in the middle of the night but we have never had a problem. People here tend to leave each other to themselves so are fine staying here a few nights. This trailer had a wood burning stove! We do take precautions like we do anywhere we boondock in remote areas. We park the truck right outside my side of the bedroom window so I can see or hear anything during the night. I have a flashlight on the shelf above my head should I feel the need to shine the light out the window. I keep the truck keys there as well. Why you ask? Do you ever lay in bed and wonder: “Did I lock the truck?” A quick push of the button on the remote answers that. It also turns the lights on momentarily and lets anyone in the area know you are awake and aware. The remote also has the panic button on it if the need ever arises. It never has but it is nice to know it is right there. We have never felt unsafe anywhere we have parked….wait I take that back. A year or so ago we parked in a Walmart parking lot and went into the rig for the night. As it got dark the parking lot got crowded and it became obvious we were in the wrong area. So we packed up and moved (to another Walmart just down the road). But other than that we have always felt pretty safe. For those visiting the area for the first time, there is plenty to do in the area. Top of our list is Saguaro National Park and The Desert Museum. We attended both of those on previous visits and will do it again when we are in the area. Old Tucson Studios where movies like 3:10 to Yuma, The Outlaw Jose Wales and Rio Bravo were filmed, Pima Air Museum for those who love air craft history and miles and miles of outstanding hiking trails also await those visiting this area. There were two other bonuses for us stopping at Snyder Hills. The first is that it is near our 2nd favorite donut shop (Queen Donuts) we have discovered so far. The criteria for what makes our favorite donut shop list is quite simple; they have to have buttermilk donuts and they have to be good and this one fits the bill. Our favorite donut shop is in Henderson, NV (Friendly Donuts). The second bonus for stopping here is that Red and Pam were at Diamond J’s just a few miles down the road! They too are slowly make their way to “Q” so it was nice to cross paths with them for a couple of days. Barb and Pam went shopping a couple of times, we did happy hour one night but unfortunately Red had a nasty cold so we were not able to get together as much as we would have liked. The other nice thing about spending a few days here is that we can get caught up on some of the things you just cannot do in a lot of the smaller towns or more remote areas we stop. We stocked up on groceries, beer and booze for one. It was during one of these outings that Barb and I had what I would call an interesting incident. Barb on the other hand would call it scary. We were just finishing up our grocery shopping and heading to the registers when we hear someone yell “Call the police!” A few seconds later “I am not kidding, call the police”. Then this guy walks within 10 feet of us gets on his knees, puts his hands behind his back and again yells, “Call the police”. You can imagine, he started to gather quite a crowd. Curious on lookers were staying a safe distance back, some continued to shop while others gathered up their small children, abandoned their carts and scurried for the door. Since we were done shopping I skirted the man and went to a register as far away as we could, got in line and kept an eye on him. He continued to yell. This went on for a few minutes. Pretty soon the guy gets up and is walking towards us. Barb gets this panicked look on her face and slowly edges further into the checkout line. The guy walks by and continues to yell. This goes on for too long, (seemed like 10 minutes). The guy walks up one side of the registers then down the other side sometimes yelling, sometimes silent. A stream of employees are following him, a couple of them on the phone (with the police I hope). Then the guys breaks into a run and sprints out the door. While Barb waited in line I went out to see where he went and see him running towards a Planet Fitness and disappears from view. Sirens are approaching but it appears the immediate area is safe so I go back inside and we pay for our groceries. As we are driving away we see the guy in the parking lot of the Planet Fitness on his knees, hands behind his back surrounded by squad cars. Scary, but you also cannot help but feel sorry for someone who is so racked with torment that that is what their life is like….. I also spent 3 hours at a Discount Tire store getting the tires rotated and balanced. This may seem like an extraordinarily long time and you would be right. It started out as an hour and a half, rotated, balanced and down the road until I got to my next stop and inspected the tires. One of the tire pressure monitors was missing! So back I went. The tech remembers putting them on the running board of the truck so he would remember to put it back on that tire…..gone. Luckily they were really good about it and gave me $50 out of the register to buy a new one. Although we did not do a lot of "touristy" things during this visit, we did get a lot done and enjoyed our time here. Next up our first visit to Casa Grande! Two Top 10's in 2 Days!